When you replace the carpet in your home or office your choices involve basic color, durability and price. 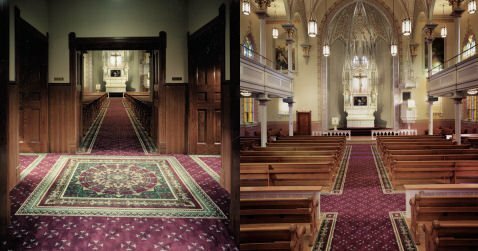 When you decide to replace the carpet in your church or temple, additional decisions involve diversity of design and installation. Artech offers a selection of devotional designs for carpeting that will accent and complement your worship space. Big box stores and neighborhood carpet stores don’t have access to the same designs. 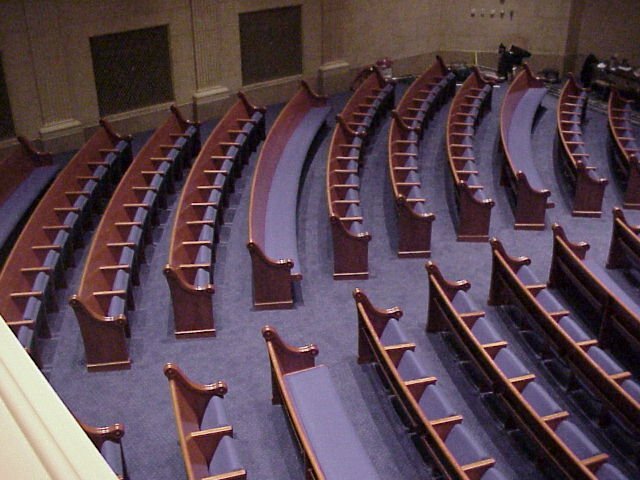 In addition, our installers have years of experience ensuring that new or refurbished pews sit firmly on the carpet surface without wrinkling, stretching, or buckling. 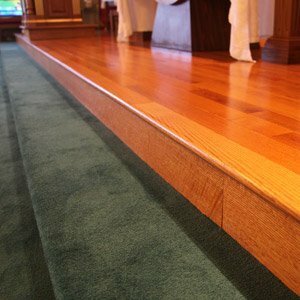 Church floors are often not perfectly level and a pew in the wrong place can wobble. Refurbished pews are moved three times during a carpet installation and some pews have a concealed anchor system instead of L-brackets to secure the pew to the floor. Artech does the job right, from the moment we move the first pew until the last pew is back in place. This church chose a tasteful pattern that matched nicely with the color of the walls, molding, and pews while minimizing the visibility of wear. 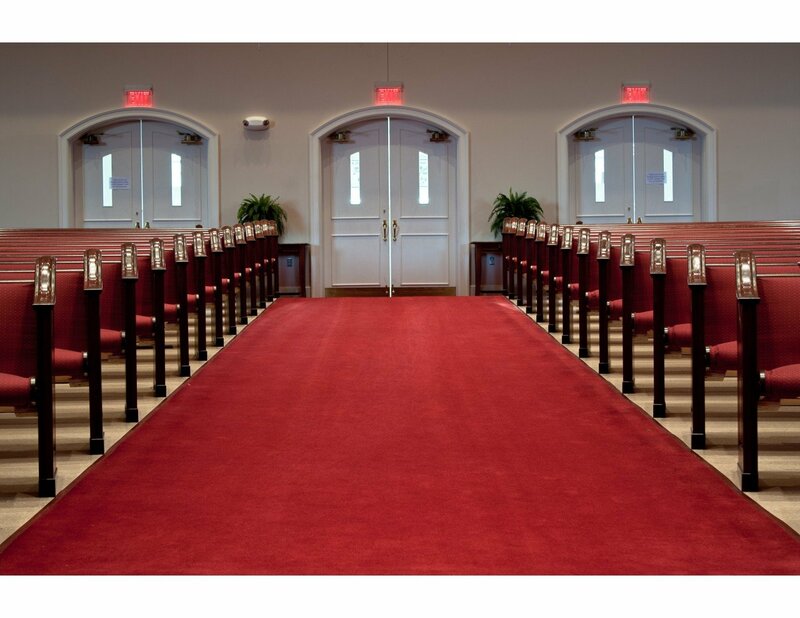 Artech’s plush commercial-grade church carpet is 100% nylon. Nylon is durable and resilient and can hold up to heavy traffic without showing wear. 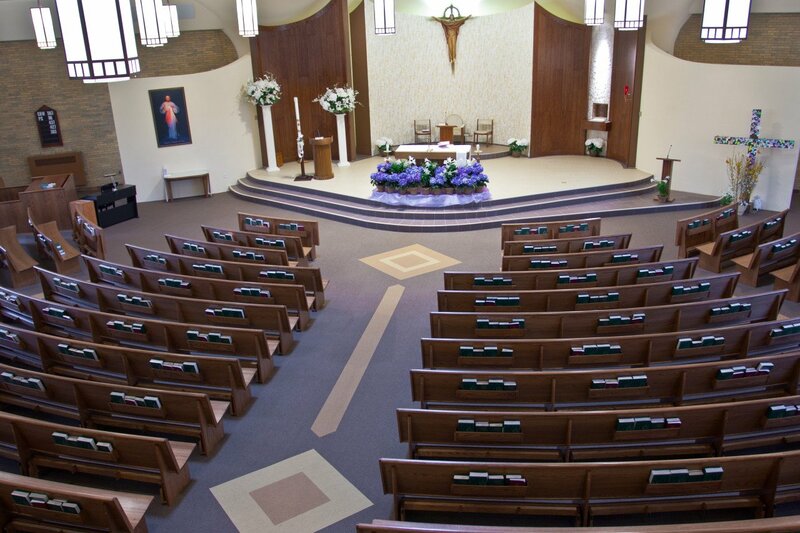 Church Carpeting presents a unique challenge unlike that of residential or commercial buildings. 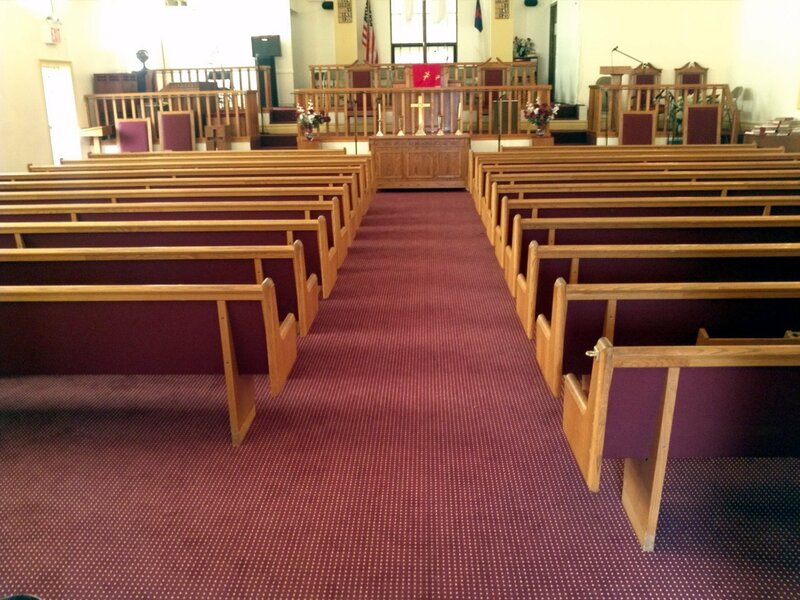 Artech Church Interiors understands the requirements for Church carpet and is not only able to install the carpet, but move and re-install the pews as well. Pews need to be moved three times during a carpet installation. Your local carpet company’s installers will not have experience in pew moving, so they do not have the required knowledge to properly label, loosen, and move Church Pews without causing damage. Nor do they typically know how to properly re-install them. 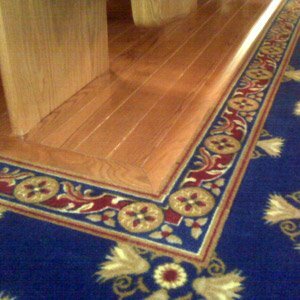 Artech’s experience, which spans decades and 3 generations in Church flooring and carpeting, has taught us that Church floors are not perfectly level and a pew in the wrong place can wobble. Some pews have a concealed anchor system instead of L-brackets to secure the pew to the floor. Many carpet installers do not bother to reinstall using these anchors. They use L-brackets instead, leaving unsightly exposed brackets instead of the more attractive concealed system. It is important to use professionals for all your Church Remodeling needs. 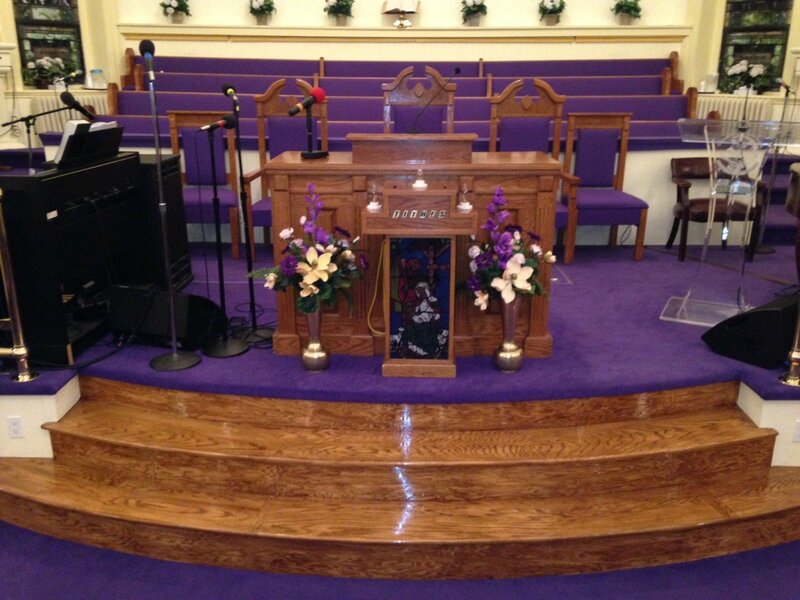 We will give you the peace of mind of knowing the job is being done right, from the moment we move the first pew, until the last pew is back in place. 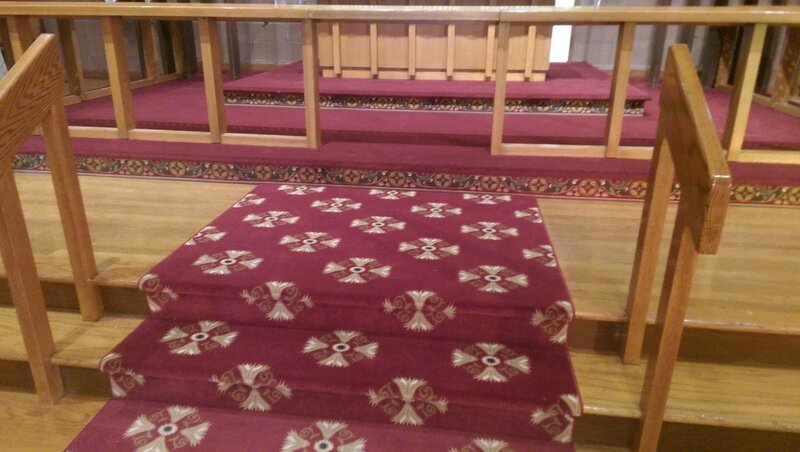 Our experienced Church interior professionals will work with you to select a carpet that matches your pew cushions. 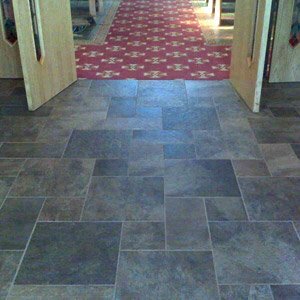 This church chose a tasteful pattern, that would match nicely with the finish color of the walls, molding, and pews and help to minimize the visibility of wear. 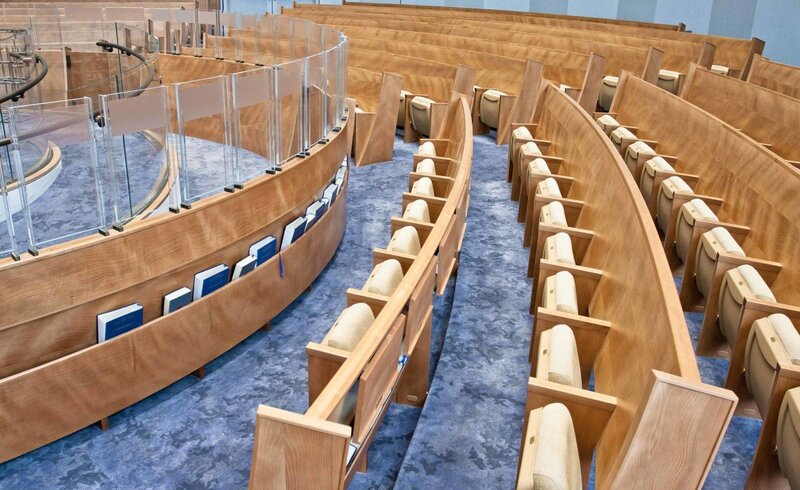 Artech’s plush commercial-grade church carpet is 100% nylon. Nylon is incredibly durable and resilient and can hold up to heavy traffic without showing wear.